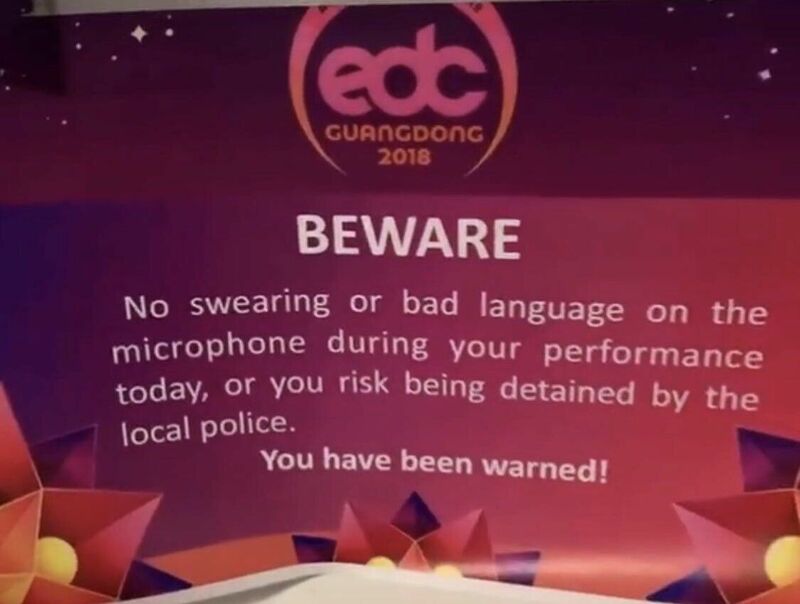 EDC China warned performers against swearing due to risk of police action last weekend. The second Insomniac event to be held in the country, which is part of a wider expansion into the burgeoning Asian dance music market, took place on Saturday 24th and Sunday 25th November in Guangdong, the most populous region in the world's most populated nation. The likes of Porter Robinson, Major Lazer and Steve Angello headlined. Alongside EDC's spectacular production values artists were also given strict instructions not to use bad language, or face detainment. The warning was circulated on social media as those booked to play got to grips with the rules, which many believe are indicative of the government's notorious attitude towards free speech. Earlier this year, a contract to broadcast the Eurovision Song Contest with China's Mango TV was 'torn up' after two performances were allegedly censored by the online network. It's worth noting, though, that London's Wireless Festival has issued a ban on swearing, offensive gestures and revealing clothing— for both performers and punters— at next year's edition in a bid to appease unhappy neighbours.